Hawaiian Spirulina provides more nutrients than any other Spirulina on the market, due to its superior growing conditions. The algae can be added to foods, to smoothies, shakes, and drinks as a way of increasing your overall health and nutrition. Nutrex Hawaii was founded in Kailua-Kona, Hawaii in 1990 by Dr. Gerald Cysewski, the algae are grown in ponds on a 90-acre site on the Kona coast. The water is kept pure of chemicals and contaminants. This area of coastline receives more sunlight than any other area in the USA, so the Spirulina will grow all year round. Nutrex pride themselves on their respect for the land and sustainability. The algae are grown using pure water, drawn from the island’s deep aquifer and filtered through natural lava rock. 5% of deep ocean water is added, to improve micronutrients and all the water used is recycled for the next crops. For advice and additional information about this supplement or helpful tips, you can contact the manufacturing company directly at the following phone number: 1-808-326-1353. Ingredients: Vitamin A (as Beta carotene), Vitamin K (K1, K2), Vitamin B12, Iron, Magnesium, Manganese, Sodium, Spirulina (Arthrospira platensis), Phycocyanin (c, allo), Gamma Linolenic Acid (GLA), Chlorophyll, Carotenoids, and Zeaxanthin. Other ingredients: Pure Spirulina (Arthrospira platensis). Spirulina is an extremely nutritious, concentrated superfood. A three-gram serving of the algae provides 60% of protein, a source of Vitamins A, K1, K2, B12, and iron. Vitamin A supports the immune system, the vision, skin, and bones. It’s an antioxidant that helps destroy damaged cells. The K vitamins help with blood clotting and moving calcium into the bones and teeth. Vitamin B12 helps to release stored glycogen and turn it into usable energy. The protein in spirulina is classed as ‘complete.’ This means it contains all the protein amino acids, both the essential and non-essential. Few plant-based foods contain all amino acids, which makes the supplement ideal for those who eat a plant-based diet, as it can be difficult to find foods containing complete proteins and vitamin B12. Spirulina is a good source of both, and Hawaiian Spirulina is certified Vegan, kosher, halal and non-GMO. Hawaiian spirulina also contains an excellent source of phytonutrients, plant chemicals, and antioxidants that support the immunity, repair cell damage and fight aging, such as carotenoids, gamma-linolenic acid and superoxide dismutase. Oxidative stress is believed to be at the root of most degenerative change within the body. Spirulina also contains phycocyanin, one of the most researched phytonutrients, due to its health properties. This phytonutrient is a blue pigment that improves the function of chlorophyll in plants. In the body it’s an antioxidant, helping repair cells and fight against aging, but it also has a specific response to inhibiting the chemicals that cause inflammation and pain. There are many reviews available online from customers who have tried this product. How Much Does Hawaiian Spirulina Cost? Hawaiian Spirulina is a lot more expensive than other similar nutritional supplements. We can see that the benefits are many, but what are the side effects of Spirulina? The most common are sensitive skin that reacts to sunlight. This can be moderated by using a good sunscreen. Some people report digestive upsets, such as nausea, vomiting, diarrhea, and constipation. It is always possible to be allergic to the product itself, but in general, the benefits outweigh the mild side effects. 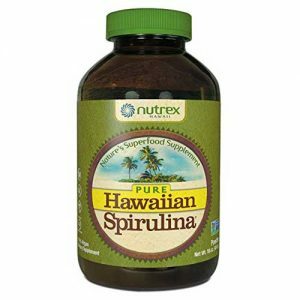 Where To Buy Hawaiian Spirulina? Hawaiian Spirulina can be ordered online from different places but our recommendation is to either buy it directly from the manufacturer or purchase it from trusted online retailers which may offer you discounts. We did a research on other products from Nutrex Hawaii. Here is a complete list.